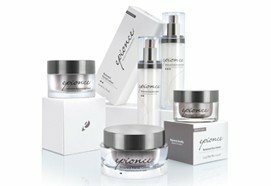 Epionce was voted the best anti-ageing skincare line in the US and is becoming one of the most popular ranges used by doctors and medical aesthetic clinics in the UK. Epionce cleanse and repair products remove skin impurities without disrupting the intercellular lipids and cells that form the natural protective barrier. The cleanse and prepare process is important because it removes makeup, dirt and oil in readiness for the application of leave-on Lytic and Renewal products. Epionce correct and boost products are proven through rigorous independent testing to reduce the appearance of fine lines, wrinkles and unwanted pigmentation. The powerful Epionce ingredients have been formulated to avoid unwanted disruption or irritation to the skin. Your skin will look smoother, with a fresher more even looking complexion. Epionce renew and fortifyIf you are new to the range and wondering which product to start with we recommend one of the Renewals or Intensive Nourishing Cream. They are the cornerstone to good skincare and once you see the improvements in your skin you will start to appreciate why Epionce has become such a popular skincare line. Formulated with a wide synergistic array of proven active botanical ingredients. Daily use of the Epionce prepare and preventproducts help protect the skin from damaging UVA and UVB exposure which can lead to ageing of the skin. Epionce sunscreens are formulated for high sun-blocking efficacy while maintaining the most elegant aesthetic qualities – smooth application and no white residue. Ideal for sensitive skin alone or under makeup. Taking care of your skin following a treatment procedure is important to ensure positive long-term results. Epionce has the answer! Formulated for incredibly sensitive post-treatment skin, two Epionce post-treatment kits are effective tools for post-procedure at-home care by enhancing the healing process. Epionce skincare can be used in conjunction with all treatments provided here at Hans Place Practice including Botox, Dermal Fillers, INTRAcel, Velashape 3, Sculptra and Aqualyx as part of a home maintenance system to ensure you get the maximum benefits from your in-clinic treatments.